When I was five years old, my Dad became a magician. He kept his day job, and the magic thing was his hobby. It was kind of like his not-so-secret superhero identity. And from the beginning I wanted to be his sidekick. Dad looked at me over the top of a children’s ministry magazine from where he sat on the brown plaid couch. He was inspecting the ad on the inside cover for a Christian Magician’s conference that summer in Indiana. It was the ad that convinced him he could fulfill his dream of becoming a magician. Mom and Dad were discussing the possibility of making the conference our summer vacation when I started to beg to be involved. I had looked at the pictures in the ad of clowns in a park and ventriloquists on stage, and formulated plans for my stage debut. “I think we can make that work. What do you think, Mom?” Dad shifted his gaze across the room to where my Mom sat. I knew she’d make it work. She can make anything work with her sewing machine. I decided to add to my list. “And a puppet too! So I can do ventriloquism. Please?” I had seen a ventriloquist on Sesame Street once. It looked easy enough. Mom raised her eyebrows and pursed her lips for a second. “Ok. We’ll have to start looking at patterns so we have time to make all this before the conference,” she said. “Yes! Thank you, thank you!” I jumped up and twirled around so excited that I didn’t know what to do with my little body. As the weeks passed, I hovered over my Mom’s shoulder as she fashioned fabric into a clown costume and yellow fur into a duck with legs and arms that wrapped around my waist and neck. The highlight of the week was the afternoon of clowning in the park. 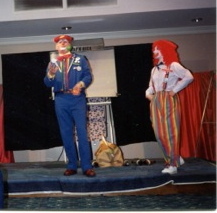 The conference advertised the event in the local papers inviting children and their families for an afternoon of free entertainment with the clowns from the conference. We had packed my new clown outfit in hopes that I could join in. The only problem was my parents didn’t know how to do clown makeup. Early in the week, my Dad met an older magician named Paul. Paul and his brother had performed as clowns on Vaudeville. He’d been around the business a long time and had the deep wrinkles in his face to prove it. My Dad asked if he could teach us how to do clown makeup. In the hour leading up to the event in the park, we met Paul and his wife in the parking lot. Paul opened up the back of his conversion van and spread out the contents of his tackle box turned makeup kit. I sat on the bumper while he knelt next to me. My parents hovered next to him taking pictures and watching his every move so they could replicate my face at home. “Now we will probably want to keep this simple. She’s still so young and less makeup on her skin is better for now,” Paul said as his rough finger carefully swiped a bit of red around my mouth. “That will make it easier on us too” Dad replied. I sat as still as possible, fearing if I breathed I might mess up my makeup and look like something from a scary movie. “Ok, almost finished” Paul said as my Dad handed him a clean sock. I gulped some air and squeezed my eyes shut. A cloud of baby powder encased my face. Then Dad pulled out a small red sponge ball he’d purchased to use as my nose. Paul carefully cut a slit in the ball then put a strong scented sticky solution on the tip of my nose. He gently pushed the sponge on my nose, then held up a mirror for me to inspect. I grinned. A clown smiled back at me. I was just excited to be part of the event. I knew this was where I belonged. Dressed up. Performing. Making others smile. Dad’s hobby and my parents’ willingness to let me participate shaped my life. My family spent at least the next 15 summer vacations at that conference. I made some lifelong friends and even met my husband. Dad and I performed together at local libraries, nursing homes, churches, and even the county fair until I graduated from high school. Thank you for this glimpse into your life. I had no idea you like to clown around so much! I clowned around for over half my life Jessie 🙂 I sometimes miss it. I love this story. Any chance you might reprise your clown routine? Perhaps at the next writers conference? Peter, I think you’re a genius. Um… Probably not!! Lol. I have the wig but that’s all. This picture is one of the last times we clowned together. After this we didn’t bother with the makeup. We just moved on with our shiny blue vests and your red hat. If being a magician is my not-so-secret super hero identity. What does that make Violet? That makes her my alter-ego Dad!